Following the arrest of a former treasurer of Spain’s ruling People’s Party (PP) earlier this year, party funding has become an important issue in Spanish politics. Juan Rodríguez Teruel writes that successive attempts to reform the regulation of party funding in Spain have created a situation in which Spanish parties are largely funded from public sources. He argues that this reliance on public funding has weakened the voice of party members, and poses additional problems for preventing corruption due to the lack of scrutiny at local levels. In recent months, corruption linked to party finance has returned to the centre of the Spanish political agenda. The problems of the ruling party with its ex-treasurer, and revelations over cash bonus payments to national leaders in the past have, unsurprisingly, encouraged general disaffection toward Spanish political parties among the electorate. As a consequence, the Spanish government has attempted to react by fostering party transparency and strengthening control on public allocations. Simultaneously, parties from the opposition are calling for a complete ban on private donations to political parties, making public subsidies their only funding source. However, it is not certain that new rules against private funding would actually be effective against Spanish parties’ current financial problems. While party corruption stemming from interest-oriented money is a delegitimising factor for the political system, we can hardly consider it a genuine consequence of the party funding system. Those engaging in corruption will probably know how to accommodate to any legal scheme. Certainly, lightly regulated party funding systems in Western countries have left the way open for bribery and the influence of private interests on public decisions. But this situation seems to have shifted in recent decades following the introduction of state finance and tough regulations in many Western democracies since the 1960s. In this context, Spain is one of the countries with the most extensive regulation of incomes and expenditures, together with substantial public subsidisation. Consequently, the reality in Spain is a different picture from the public discourse of parties and citizens: the most relevant feature in Spain is the predominance of public funding and its potential consequences. The principle of public party funding was implemented in the early days of the new democratic regime in Spain in order to subsidise electoral campaigns and the activities of political parties. Later, in 1987, strict limits were applied to private funding, although anonymous private donations – a real incentive for interest-backed money – were permitted until 2007. All minor reforms since then have attempted to regulate public funding on the grounds of political equality and the (unsuccessful) containment of public subsidies. The anti-corruption argument only appeared as a main concern during the last reform in 2007. Spanish political parties are therefore funded extensively, and without ideological differences, by state allocations – mainly in the form of direct subsidies from the public budget. 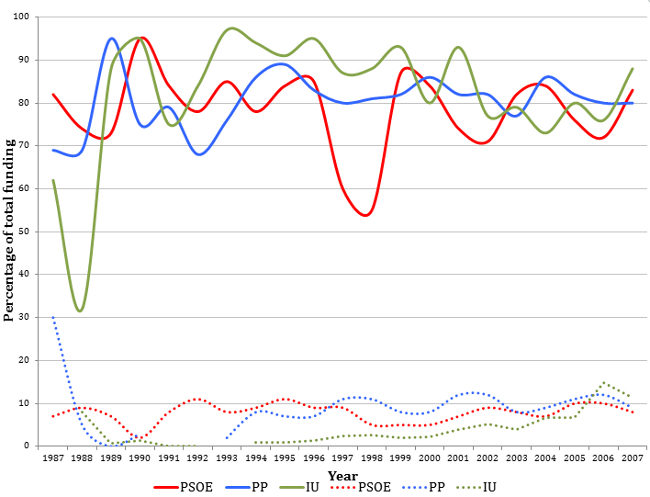 Figure 1 shows that around 80-90 per cent of party funding for the main political parties – the People’s Party (PP), Socialist Party (PSOE), and United Left (IU) – comes from public sources. Indeed, private funding is extremely limited, as are fees collected from party members. Note: The solid line shows the percentage of party funding which comes from public sources, while the dotted line shows the percentage coming from party membership fees. Source: Own elaboration from the CoA, calculated by Gloria Martínez-Cousinou. This high dependence on state funding is consistent with the view of political parties as ‘state agencies’ or ‘public utilities’. However it might also be interpreted as the reflection of endogenous weakness of parties in their function as the representative agents of civil society. Indeed, Spain has some of the lowest party affiliation rates among Western countries, despite a steady increase shown in official figures of party membership. The insignificant role grass-roots members play in financing party activities suggests that they also have a weak voice in dealings with party machines – which is not a particularly good advert for younger generations to join political parties. The evolution of the amount of public subsidies has not only remained high for years proportionally, but has also grown gradually in absolute terms. Figure 2 shows this steady increase since 1987, using data provided by the Spanish Court of Auditors (CoA). Between 1987 and 2008, the total amount of state allocations increased by almost 60 per cent (in constant prices). Significantly, every new change in party funding regulation geared toward setting limits on private donations has resulted in more public resources for parties. Still, we do not yet know the results of the 2012 reform (conditioned by the context of economic crisis), which might well have led to a different result. Even more important, the public funding scheme has developed in a multilevel setting, which has provided political parties with a great opportunity to expand their state subsidies. 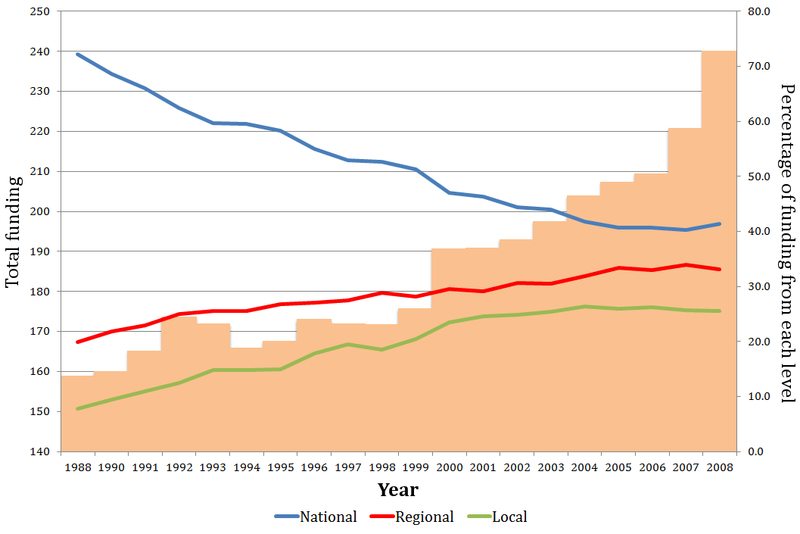 Indeed, as Figure 2 shows, the public allocations coming from national institutions have declined over time, while regional and local subsidies have increased. Hence, since 2000 the public party funding coming from subnational institutions is larger than the national state subsidies. Note: The figures on the left axis and the shaded area indicate the total level of public funding (in millions of euros). The figures on the right axis and the three solid lines show the percentage of funding made up by each level (i.e. funding at the national, regional and local levels). Figures for local funding are an estimate. Source: Spanish Court of Auditors. This situation has the potential produce three major effects. First, factionalism may increase over time, especially regarding territorial policy decisions. While Spanish national leaders still see themselves as the main (if not the only) rulers of their party, in reality they must rule the party through increasing bargaining and agreements with the regional heads of the party. In a context of compulsory reduction of state subsidies, this may be a reason for new conflicts between national and local party leadership. Second, party elites’ internal control over their finances is eroded since they are no longer responsible for vast sums of money coming to the party machine. This is especially true in the case of those parties (like PSOE or IU) with strong regional branches, although even the PP has found out in recent party scandals that there are a lot of stories happening below their feet. Finally, external control from auditors may become weakened due to lack of supervision. Indeed, Spanish regulations on party funding explicitly exclude local funding from the scope of the Court of Auditors. This is one of the main concerns expressed by GRECO, the Council of Europe’s anti-corruption monitoring body, in its 2009 and 2013 reports. Although the 2007 Act intended to improve this situation by bringing regional funding under the control of the Spanish Court of Auditors, local incomes remained off limits. Even party central offices do not know exactly how much money they are collecting at the local level. These effects might combine dramatically in some situations. For instance, the strengthening of intra-party democracy and, more particularly, the implementation of internal primaries to select candidates and leaders at the local level (as some civil movements in Spain are advocating) will increase the cost of party politics, reinforcing the demand for more public funding. Furthermore, it may encourage local fundraising outside of the control of a party’s central office. If public debate only views party funding from the perspective of preventing corruption, we may be losing the chance to improve regulation in other party domains. These areas are less conspicuous, but may have far more dramatic consequences for the transparency and legitimacy of political parties. Juan Rodríguez Teruel is Lecturer in Political Science in the University of Valencia. He is editor of the Spanish political blog Agenda Pública. His research focuses on political elites, political parties and decentralisation. He was awarded the 2007 Juan Linz Prize for his PhD on Spanish ministerial elites.